They’ve extended this sale by one day. 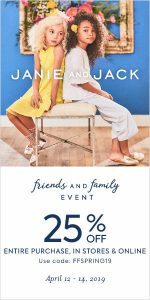 Check out the Janie and Jack Friends and Family Event: Save 25% off Your Entire Purchase with promo code FFSPRING19. Valid through 4/15. Orders over $100 get free shipping.